William McCAW Sr. (1740 – 1796) was Alex’s 6th Great Grandfather, one of 128 in this generation of the Miner line. William McCaw was born about 1740 in County Antrim, Northern Ireland. 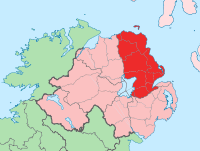 According to some family traditions, the McCaws were from Ballymoney, Antrim where a Presbyterian Conventer Church was located. He married Ann [WATSON? or MARLAND?]. William and his family emigrated between 1762 when Elizabeth was born in County Antrim, Ireland and 1765 when Martha was born in Chester County, SC. Two ships sailed from Belfast to Charleston in that time period. The Falls in 1763 and the Prince of Wales in 1764. William died in 1796 in Chester, South Carolina. Ann [Watson?] was born about 1740. Ann died in 1800. 24 Jul 1803 5 Mar 1840 Chester County, South Carolina. The McCaw name is Scottish in origin meaning “son of Adam”. The McCaw’s did not have a clan of their own but were affiliated with the clan “Stewart” of Bute. In 1750 Presbyterians from Octoraro, Virginia, and North Carolina, came to South Carolina and settled at Rocky Creek, Chester County. By 1755 Irish immigrants, many of them Covenanters, began arriving. Various groups (Associate, Covenanter, Burgher, Anti-Burgher, Seceders) formed the “Catholic” (meaning a union of various groups of Presbyterians) church on Rocky Mount Road, 15 miles southeast of Chester SC. The impetus for the colonization was the combination of exorbitant land rents in Northern Ireland, sometimes provoking violent resistance, and the offer of free land and inexpensive tools and provisions tendered by the colonial government of South Carolina. For instance, each Scottish Covenanter was entitled to 100 acres for himself and 50 acres for his spouse, and an additional 50 acres for each child brought to South Carolina. Chester County – (581 sq. miles; 2000 pop. 34,068) Named for Chester County, Pennsylvania, it was settled by Scots-Irish from Pennsylvania and Virginia. Chester was one of seven counties created in 1785 from the old Camden Judicial District. Situated in the rolling hills of South Carolina’s eastern Piedmont, Chester is bounded on the east by the Catawba River and on the west by the Broad River. Unlike other counties established at the same time, Chester’s dimensions have never been altered, and its distinct rectangular shape is unique among South Carolina counties. 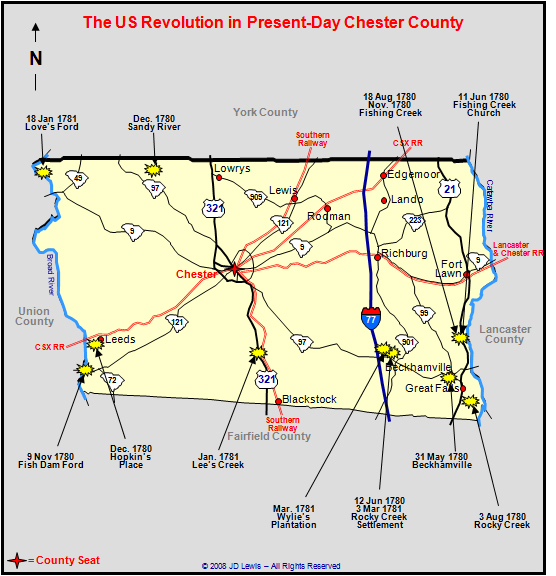 The county seat of Chesterville (later Chester) was created in 1791. During the Revolutionary War, American forces under General Thomas Sumter were defeated in Chester County at the Battle of Fishing Creek in August 1780; the Americans were victorious at the Battle of Fishdam Ford in November of the same year. 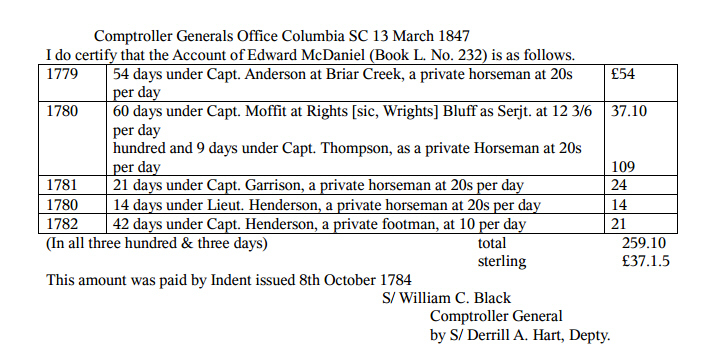 The Chester, SC records are confusing because the names in the Deed Index are listed as McCaw/McCaa/McCaully/McCalla, etc. Chas Miller bought 150 ac on Bull Run from Wm McCaw, Jr. in 1804. Per the Will of Wm McCaw, Sr, Wm Jr was the son of Wm McCaw, Sr and James McCaw was his son [i.e. brother of Wm Jr] who lived on adjacent land. In the Deed Index, this 1804 transaction is listed as Wm McCaully, Jr to Charles Miller, but the actual deed gives the name as McCaw. In census records, the name is given as Wm McCaa, later McKee, McKey, etc. There were no standardized name spellings prior to about 1900 and many court clerks couldn’t even spell right. Nevertheless, McCaw seems to be the accepted name and spelling. There were other McCaws in Chester and York Counties. John McCaw of York County, north of Chester County came from Antrim to Pennsylvania, then to York. John McCaw was the first clerk of court in York (Rev. War period). The McCaws who came into the Hopewell Covenanter congregation in Chester (Rocky Creek and Bull Run areas) appear to be a different group. Rev. William Martin’s daughter, Nancy Stinson Martin married a John McCaw, but died soon after before her father’s death in 1807. “His only daughter, who married John McCAW of York Co., predeased him, leaving issue.” Sketch of Covenanters on Rocky Creek” from Chester (S.C.) Report, in the Reformed Presbyterian and Covenanter, Vol. X1V (1876) PP:171-177. Next I give and Bequeath unto my Son William McCaw all the Remainder of my Lands Houses and Improvements Excepting my Loom House which I alow for my Daughter Jane as Long as She Sees Cause to Live in it, I Likewise alow her to have ten acres of Land five of James’s divide and five of William to be Laid off at the Discresion of my Executors as Long as She Lives to Enjoy the Benefit of it and then to Belong to the Sd. James and William as Before and Nest. William ^ his mark ^ McCaw L.S. Beersheba Presbyterian Church Cemetery, Clover, York County South Carolina. “John McCaw, son of the Immigrant and the founder of the York County branch of the SC McCaws, first appears in South Carolina in militia records. In 1781, his name appears in a York County deed book when he buys 300 acres on Crowder’s creek from David Neel. He continued to buy famrland until 1809. In 1787, he bouth a lot in York, on which he built a log building to house his mercantile setablishment and his family. His wife, “the Widow Gordon,” was born Mary Johnston, a daughter of Robert Johjnston Sr., and his wife Mary, as was the widow of Henry Gordon, who is said to have died at the Battle of Kings Mountain. The John McCaw household also included Mary Johnston Gordon’s child, Mary Gordon”. i. Mary “Polly” Gordon b. 25 Dec 1779 in York, York, South Carolina; d. 19 Jul 1867 in York, York, South Carolina; m. 27 Aug 1795 – York, York, South Carolina to David “Davie” Byers (b. 3 Oct 1774 in York, South Carolina – d. 16 Aug 1862 in York, South Carolina) In the 1860 census, David (age 86) and Mary (age 81) were living with their son Edward Byers near Sharon, York, SC. The Battle of Kings Mountain was a decisive battle in the Southern campaign of the Revolutionary War. The battle took place on 7 October 1780 nine miles south of the present-day town of Kings Mountain, North Carolina in rural York County, South Carolina, where the Patriot militia defeated the Loyalist forces commanded by British Major Patrick Ferguson of the 71st Foot. Ferguson had arrived in North Carolina in early September 1780 with the purpose of recruiting for the Loyalist militia and protecting the flank of Lord Cornwallis’ main force. Ferguson issued a challenge to the rebel militias to lay down their arms or suffer the consequences; in response, the Patriot militias rallied for an attack on Ferguson. After receiving intelligence on the oncoming attack, Ferguson elected to retreat to the safety of Lord Cornwallis’ host; however, the Patriots caught up with the Loyalists at Kings Mountain on the border with South Carolina. Having achieved surprise, the Patriots attacked and surrounded the Loyalists, inflicting heavy casualties. After an hour of battle, Ferguson was shot dead while trying to break the rebel ring, after which the Loyalists surrendered. The battle was a pivotal moment in the Southern campaign; the surprising victory over the Loyalist American militia came after a string of rebel defeats at the hands of Lord Cornwallis, and greatly raised morale among the Patriots. With Ferguson dead and his militia destroyed, Cornwallis was forced to abandon plans to invade North Carolina and retreated into South Carolina. I give and bequeath to my beloved wife Mary McCaw if she should survive me, the use, during her life of the property of which I may died possessed. To my three sons Robert, William and John I give and bequeath one Dollar to each. I give and bequeath to Robert McCaw and John McCaw Jr., for the use of Elizabeth Meek, Pamela Gunning and Sarah Sims all the money which shall remain at my death, or the death of Mary McCaw aforesaid, to be equally divided between them. I hereby nominate and appoint Robert McCaw and Robt Smith John McCaw Jr my Executors. i. Ann McCaw b. 3 Mar 1782 in York, South Carolina; d. 23 Oct 1826 in York, South Carolina; m. Nov 1800 York, South Carolina to Robert Smith (b. 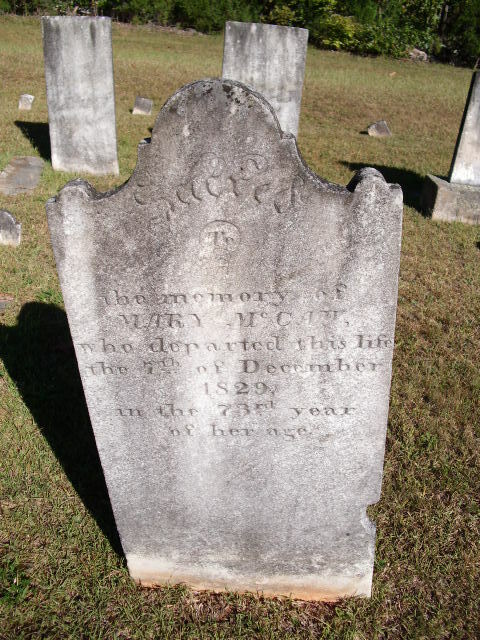 3 Oct 1778 in York, South Carolina – d. 3 May 1854 in York, South Carolina Burial: Beersheba Presbyterian Church Cemetery, Clover, York County, South Carolina) His parents were James Smith and Mary Henry. iii. William Henry McCaw b. 1785 in York County, SC; d. 13 Dec 1832 in Columbia, Richland Co., SC; m. 14 Nov 1814 to Frances Elizabeth Hunt Todd (b. 19 Oct 1796 in Near Charleston, SC – d. 29 Mar 1860 in Abbeville, SC); Feb 1811; Graduation, Pennsylvania Medical College in Philadelphia; In 1812 He was commissioned a surgeon’s mate in the US Army. He was stationed in James Island, near Charleston and was demobilized in 1814. William and Frances owned property on James Island, near Charleston, and William had a mortgage on a house in Bedon’s Alley in Charleston. Those properties were eventually sold, as were one or more of his slaves, perhaps to finance land purchases in Abbeville County. Before October 1816, William moved his family to grow cotton near Abbeville, SC, in a settlement called Church Hill. The Abbeville County census of 1830 records three free and 49 slave members of his household. In 1824 he was appointed Postmaster of Church Hill. He is buried in the Ladson Plot, First Presbyterian Churchyard, Columbia, SC. iv. Elizabeth McCaw b. 1789 South Carolina; d. 1842 – Tallahatchie, Mississippi, m. Mar 1809 – York, South Carolina to James Meek (b. 1789 in York, South Carolina – d. 1844 in Tallahatchie, Mississippi) His parents were Adam Meek and Nancy Agnes Byers. James and Elizabeth moved from York County, SC, to Yalobusha County, Mississippi. Several other McCaw siblings moved to this area of Mississippi, and are buried there. In the 1860 census, John’s real estate in Lexington, Kentucky was evaluated at $10,000 and his personal property at $167,500. In the 1870 census, his real estate was $16,000 and personal property $120,000. Benj. C. Wood bought Lot No. 16 of the Robt. Barr sub-division, stating “90 feet on a new street,” October 3, 1838, from Simon and Hyman Gratz of Philadelphia, Pa.
Wood and his wife, Susan Ann, sold “a certain house and lot with the outhouses and premises” May 12, 1842, to Judge Thos. M. Hickey, for $6,150. Judge Hickey died here, apparently, as he had sold “Coolavin” to James R. Sloan, and his widow reserved this fine home after giving to her heirs the various houses Judge Hickey owned elsewhere. Catherine A. Hickey, the widow, sold this house “devised to her by Thos. M. Hickey,” to John McCaw in May, 1852. John McCaw presented the property to his daughter, Emma McCaw, in 1880. This distinguished old home of some of Lexington’s most prominent families is today serving as St. Peter’s School. Sarah Allen McCaw b. 29 Jan 1827 in Chester, Chester, South Carolina; m. James Lane Allen, in 1856; d. 24 Feb 1864. Mary Johnstone McCaw b. 24 Nov 1832 in Kentucky; d. 27 Dec 1881 in Kentucky; m. 14 Sep 1852 to R B Kendall in Kentucky. Twins of above unnamed, died at birth. Emma McCaw, b. 7 Sep 1839; d. 20 Sep 1924. Nina McCaw, b. 13 May, 1849 Lexington, Kentucky; m. 16 Apr 1872, to Edward Coleman, d. 4 Mar 1879.
vi. Pamela McCaw b. 19 Nov 1797 in York County, SC; d. 02 Feb 1850 in Union County, SC; m. John E. Gunning. There was a John E Gunning in the 1820 census in Chester, Chester, South Carolina with a household of 12, six family member and six slaves. vii. Sarah McCaw 1801 – 1882 m. William A. Sims (b. 24 Aug 1799 to . – d. 5 Nov 1883 in Santuc, Union, South Carolina) His parents were William Sims and Elizabeth Shelton. In the 1860 census, William and Sarah Simes were farming near Unionville, Union, South Carolina with seven children at home ages 15 to 26. William’s real estate is listed at $5,000 and personal estate at $100,000. His grandfather Charles Sims was a Captain in the Virginia troops. Braddock’s Defeat was a failed British military expedition which attempted to capture the French Fort Duquesne (modern-day downtown Pittsburgh) in the summer of 1755 during the French and Indian War. It was defeated at the Battle of the Monongahela on July 9, and the survivors retreated. The expedition takes its name from General Edward Braddock, who led the British forces and died in the effort. Braddock’s defeat was a major setback for the British in the early stages of the war with France and has been described as one of the most disastrous defeats for the British in the 18th century. Elizabeth was born County Antrim, Ireland, but emigrated to this Country in the 7th year of her age. She was married in the heat of that fearful war which Great Britain waged against the “thirteen colonies.” She became the Mother of her first child whilst the devouring [?] cannon was still roaring in the mortal [?] ships and had to struggle through a long life only partially assisted by her husband, whose wound in his country’s cause rendered him unfit to pursue any service [? ]manual employment; Yet God who feeds his children fed her abundantly, and enabled her to rear a large and respectable family. William McDaniel was a public surveyor in Chester County. Edward served as an elder in Old Purity Presbyterian Church in Chester District until about 1807 when he went to Hopewell ARPC to serve as an elder there. Edward died 12 Mar 1824 – Chester, South Carolina Purity records show that Elder Edward McDaniel was installed as an elder at Purity before 1800, but no date was given of his dismissal to Hopewell ARP Church. Purity records show that Elder Edward McDaniel was installed as an elder at Purity before 1800, but no date was given of his dismissal to Hopewell ARP Church. Elizabeth and Edward had eleven children. Daniel William was a Public Surveyer. Jane lived with her sister-in-law Annie McDaniel in the 1850, 1860 and 1870 censuses. iii. Abigail McDaniel b. 27 Feb 1786; d. 28 Nov 1850 Blackstock, Chester, South Carolina; Burial: Hopewell ARP Church, Blackstock, Chester, SC; m. Robert Mills (b. 1783 in Blackstock, Chester, South Carolina – d. 22 May 1870 in Blackstock, Chester, South Carolina) In the 1850 census, Robert and Abigail were farming in Chester, South Carolina. iv. Anne “Annie” McDaniel b. 19 Dec 1787; d. 1877 Hopewell Reformed Presbyterian Church Cemetery, Blackstock, Chester County, South Carolina; Did not marry, Annie lived with her sister Jane in the 1850, 1860 and 1870 censuses. vii. Jane McDaniel b. 18 Oct 1794 South Carolina; d. 1 Nov 1872 – Hopewell Reformed Presbyterian Church Cemetery, Blackstock, Chester, South Carolina; Unmarried; , Jane lived with her sister Annie in the 1850, 1860 and 1870 censuses. viii. Mary McDaniel b. 24 May 1796 South Carolina; d. 14 Aug 1881 – Marshall, Mississippi; Buried at Mt. Carmel Cemetery, Cayce, Marshall, MS; m. Aug 1825 to William Boyd (b. 21 Jul 1798 in Chester Co., South Carolina – d. 29 May 1876 in Marshall County, Mississippi) In the 1850 census, Mary and William were farming in Northern Division, Marshall, Mississippi with eight children at home. Marshall County is part of the Memphis, TN–MS–AR Metropolitan Statistical Area. In the 1880 census, Mary was living with daughter Martha and son-in-law M. Braddy in Bainsville, Marshall, MS. 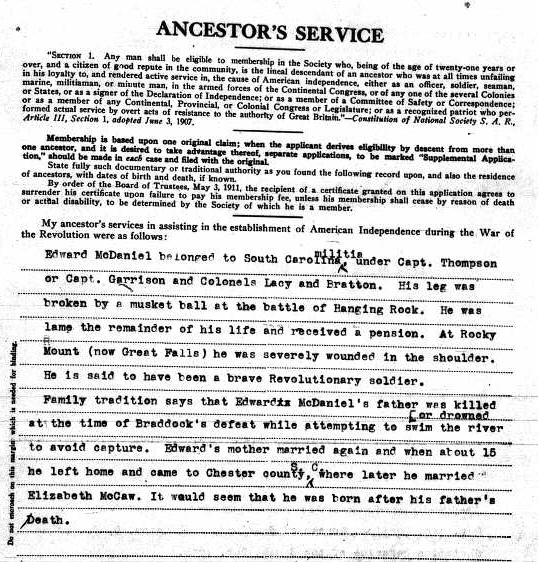 Muster Roll, not dated: Charles J. Boyd, Private, Capt. Geo M. Moseley’s Company (Walker Reserves), 1 Regiment Mississippi Volunteers (subsequently Company A, 1st Mississippi). In the 1860 census, Col J and Jannet were farming near Torbet’s Store, Chester, South Carolina with six children at home ages 12 to 29. Wounded at Fort Harrison 30 Sep 1864 , Gunshot wound in right forearm, amputated (used Choloform. Died of wounds 19 Oct 1864 at Jackson Hospital, Richmond, VA and buried Hopewell Reformed Presbyterian Church Cemetery, Blackstock, Chester County, South Carolina. Not all their sons died in the war. Their son John Hemphill McDaniel (1835 – 1918) survived and had a successful career. Sargent J. H. McDaniel. age 24. enlisted at Chester on 11 April 1861. Company G (Capt J. M. Moore-Pickens Guard), 6th South Carolina Volenteers. Promoted to 2nd Lt, Company F, 8 January 1864. He was as on a roll of POWs at Appomattox Court House, VA, USA, 9 April 1865. He lived in Pleasant Grove, Chester County. Served 4 years in the State Legislature, and 8 years as State Senator and 5 years as Probate Judge of Chester County. Was Chairman of the Senate Committee in Agriculture. Ann’s husband Charles Christopher Miller Sr was born 5 May 1757 in Antrim, Ireland. His parents were Josias M Miller (1732 – 1785) and Elizabeth Hindman (1732 – 1799). He may have married Ann about 1784. Between 1806 and 1810 in Chester, South Carolina he married Jennet (Jenny) McBride (b. Birth 1771 in Ireland – d. 1821 in Chester County, South Carolina). Finally, in 1821 in Chester, SC he married Agnes Nancy Cameron (b. 1780 in Ireland or South Carolina – d. 31 Dec 1841 in Henry County, Georgia) Charles died before 01 May 1837 in Henry, Georgia. 27 Jan 1804 Deed Vol. K pp136-138; Charles Christopher Miller Sr. buys 150 acres on Bull Run from Wm McCaw Jr.
iii. Charles Miller Jr b. Feb 1792 in Chester, South Carolina; d. 03 Feb 1838 in St Johns, Florida Buried St Augustine Cemetery; Charles was a blacksmith. Associate Reformed Presbyterian Death & Marriage Notices Volume II: 1866-1888 Compiled by Lowry Ware Scmar Columbia, South Carolina 1998Died in DeKalb County, Ga., February 27th, 1868, Mrs. Ann Miller, in the 71st year of her age, of cancer on her face…. was born in County Antrim, Ireland in 1796, emigrated to America with her parents, John and Margaret Wilson, in 1801. The ship in which she and her parents sailed was partially wrecked out at sea and was driven into the cove or harbor at Cork, where two of her sisters died of small pox. After the repair of the vessel, with a favoring Providence, she and her parents landed at Charleston in May, 1801, and settled in Lancaster District in the Waxhaw settlement under the pastoral care of Rev. Dickson, then removed with her mother and stepfather, J. Harmon, until after the War of 1812. In 1815, she and Mr. Robert Miller were united in the bonds of marriage, shortly afterwards connected themselves with the Presbyterian church at Catholic, then under the pastoral care of Rev. Robert McCullough. In 1825 she with her husband removed to Newton Co., Ga., and were among the founders of the Associate Reformed church, called Hopewell, near the Snapping Shoals on South River. In 1852, after the death of her husband, she removed with her children, seven sons, up into DeKalb Co., Ga., and connected with Prosperity church by letter, in which church she remained a worthy member. v. Nancy Agnes Miller b. 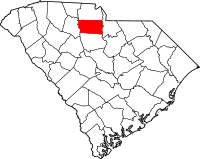 1794 in Chester, South Carolina – d. 1875 in Clay, Alabama; m. 1812 to Andrew Jackson Swann (b. 1791 in Fairfield, South Carolina – d. 1865 in Bluff Springs, Clay, Alabama) In the 1850 census, Andrew and Nancy were farming in Beat 13, Randolph County, Alabama. viii. Henry Miller b. 14 Jan 1814 in Chester, South Carolina; d. 21 Jun 1894 in Coosa, Alabama; m. 17 Aug 1843 Cherokee, Georgia to Martha S F Bell (b. 18 Dec 1823 in Cherokee, Georgia – d. 22 Oct 1907 in Coosa, Alabama) In the 1880 census, Henry and Martha were farming in Rockford, Coosa, Alabama. ix. James Miller b. 14 Jan 1814 in Chester, South Carolina; d. Btw. 1860 and 1870 in Coosa, Alabama; m. 1834 to Mary (Polly) Gibson (b. May 1819 in Laurens, South Carolina; d. 1900 in Coosa, Alabama) In the 1860 census, James and Mary were farming in Subdivision 2, Coosa, Alabama with eight children at home. Jane’s husband William Brannen was born about 1770. 27 Jan 1804 Deed Vol. K pp136-138; William’s brother-in-law Charles Christopher Miller Sr. buys 150 acres on Bull Run from Wm McCaw Jr.
http://genforum.genealogy.com/mccaw/messages/201.html Researching family of this William McCaw, of Chester District, South Carolina; interested in his siblings, migration, marriage to Ann [WATSON?] and children. Would like to correspond further with other researchers of this / these families. Interested in substantiating who were his parents–was he William McCaw, the son of immigrant John McCaw, first in Colleton County by the late 1730’s, formerly of eastern Pennsylvania and a Deputy Surveyor, who [John McCaw] later died in Yorkville, York District, South Carolina? Or was he immigrant William McCaw associated with the Hopewell Presbyterian Community of Chester District, South Carolina…. This entry was posted in -8th Generation, Immigrant - Scot-Irish, Line - Miner, Storied and tagged Battle of Hanging Rock, Battle of Kings Mountain, Battle of Rocky Mount, Braddock's Defeat, Scots-Irish Pioneer, Slave Owner. Bookmark the permalink. 10 Responses to William McCaw Sr.
1550/60 McCaw family came to Ballintoy, County Antrim, Northern Ireland with the Stewarts of Ballintoy from Isle of Bute, Scotland. Members of this McCaw family are referred to as ‘Ulster Scots’. 1740 John McCaw Jr of Templastra d. Feb 4, 1821 aged 81 years. Buried at Ballintoy Church of Ireland, Co. Antrim, Ireland. “William his son b. 1775 wdtl (who departed this life) April 5, 1841 aged 66 years buried with him”. My ancestor, Daniel McCaw, came from Philadelphia to Niagara area Ontario where he worked as a cobbler/bootmaker. His son took a land grant in Adelaide and his son, John, bought a farm in Metcalfe. He married Mary Johnston and had 10 children, including my grandfather, Leonard. many similarities in family names as well as occupation.